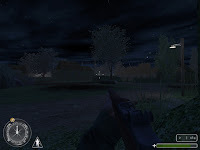 This mission Could be easily resume, Somewhere in Normandy just after the 7th june you and your team are droped by night near a village to 'clean' it and to destoy also two german Flag 88. The only problem is that you where drop to fast and so you will need to succeed all objectives alone but also meet the rest of your squadron at the outskirt of the village to finish the mission. 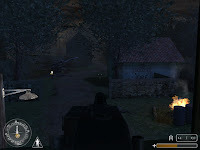 The mission start direcly with several houses, a truck an a MG42 (would like to have a short dropping scene before). Progression is obvious through design and architecture well handle to create a correct village with a good neight atmosphere. Even if there isn't a lot of exploration arround the road you need to follow the varied layout change in building texturing, small river, surrounding walls, not too flat terrain breaks the monotony. All objectives are also put well together with the correct challenge in each places. Gameplay is quite well balanced with weapons change and disponibility being place to give some variation, some trap and ambush (inside building, truck with squad, MG42 on window) add here and there also some good challenge, all being coded proprely. There are no real disapointment trough this release exept perhaps that the experience was too short and give in most of the place to closed combat making them , if you same at the right point, not to much difficulty. In conclusion: Another well put together mission this time by night using a good, non repetitive mix between architecture objectives and combats. Lighting isn't perfect like the enemy placement (would have like at the end a counter attack against witch you need to resist for a certain period) but appart from those minor glitches it's another recommanded mission.